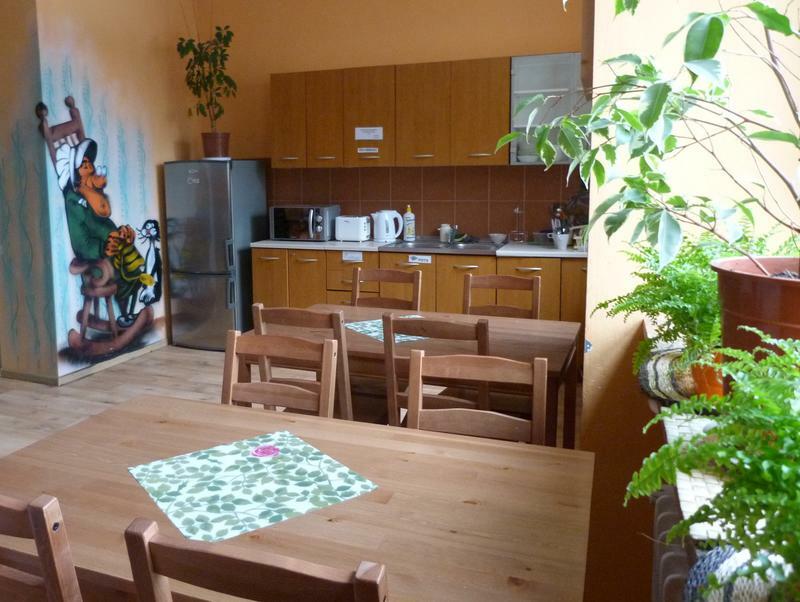 Our unusual hostel is located in the heart of Warsaw and was founded by Work for the Blind Foundation. Because of our founders social mission and transfer of profits part in order to perform statutory goals of Foundation, you contribute to improvement of the situation of blind and partially sighted people in Poland by visiting us. We are close to the Central Railway Station (approximately 1 kilometre) and the bus from the Chopin Airport stops on the next street. More than ten bus and tram lines running to the whole Warsaw have their stops in the Hostels neighbourhood. Furthermore Swietokrzyska Metro Station is just 80 metres from our location. Camera Hostel has in the offer 80 lodging places both in private rooms and dorms. Dorms can fit three to twelve lodgings. Some rooms have sanitary facilities. Shared bathrooms and equiped kitchens (fridge, microwave oven, toaster, electric kettle) with dining facilities are available on every floor. In our Hostel there is also a living room with a TV, books, movies, free maps of the city and board games designated to our guests. There is a free Wi-Fi. Hostel is open 24 hours, it has its own parking and it is monitored by security cameras. Having the safety of our guests at heart the entrance to the building is guarded by a professional security company. Within a stone's throw you can find shops, restaurants, fast foods, clubs, theatres, cinemas, coffee shops, post office, newsstands, drug stores and ATMs. In our Hostel we combine love to films, passion for travels and originality. Regardless of the purpose of your visit, we will provide you nice atmosphere, professional service and we will do our best to make you feel like home. WE WARMLY INVITE YOU TO OUR HOSTEL! Get a bus from the Marriott Hotel (opposite the station). Get off at CENTRE bus station, then walk down the street Marszałkowska Street to the intersection with Świętokrzyska Street. Turn left and go 90 meters through Świętokrzyska Street - the second block is Jasna Street. Our hostel is in the first gate. Exit Central Station to the Emilia Plater Street and head straight along Aleje Jerozolimskie Street. Get to the Central Metro Station, choose destination Młociny and get off at Świętokrzyska Station. Head down Świętokrzyska Street until you get to intersection with Jasna Street. Our hostel is in the first gate. Exit Central Station to Emilia Plater Street. Get across the street and go left past the Palace of Culture and Science. Get past Plac Defilad Street and you'll reach intersection Marszałkowska's and Świętokrzyka's Streets. Follow Świętokrzyska Street to the Nowy Świat Street - the second intersection is Jasna Street. Turn left at Jasna, come to the hostel. The hostel is located in the first gate. Walk should take about 10 minutes. Take bus No. 175 and get off at the stop CENTRE. Head down Marszałkowska Street until you reach Świętokrzyska Street. Then down Świętokrzyska Street to the intersection with Jasna Street. Our hostel is in the first gate.